Peter Rago will serve as Commander of the St. Stanislaus Memorial Post No. 1771 of the American Legion here for the coming year as the result of an election of officers conducted in the club headquarters at 119 Driggs avenue.Others elected to office are Stanley Jaskot, Leonard Wasniewski, Ed Horst and Edward Wroblewski, Vice Commanders; Rudy Fafalak, Adjutant; Michael Justynowicz, Finance Officer; Fred Orzechowski, Acting Chaplain; Anthony Horst. Historian; Joseph Podlaski, Sergeant-at-Arms; Alexander I Malewski, Judge Advocate, and Richard Plumer, Service Officer. The Executive Committee Elected included Edmund Zilinski, Philip Spizuoco, Felix Wroblewski, Matthew Wilson and John Montagano. Installation of the new officers will take place at the Club Headquarters at a later date. The newly elected officers will take over their respective duties at the July 1 meeting. Upon accepting the leadership of the Post, Rago declared “I call upon my fellow Legionnaires to assist me in making this year a year of challenge, of challenge accepted and mastered”. This is the true story of the American Legion. Service to the community, service to the youth of our community, service in promoting Americanism and the many facets of American Life which represents humanity at its best. Saturday will long be remembered by those fortunate enough to be able to get through the doors of the St. Stanislaus Memorial American Legion Post Headquarters. It was a standing room only event at the installation of officers at 119 Driggs avenue that night. A buffet dinner and refreshments were enjoyed by the audience attending. Leonard Wasniewski, first vice-commander, was chairman of the arrangements, being ably assisted by past commander John Brady. Peter Rago, commander; Leonard Wasniewski, Stanley Jaskot, Ed Horst, and Edward Wroblewski, vice commanders; Rudy Fafalak; adjutant, Michael Justynowiez; finance officer; Fred 0rzechowski, acting Chaplin, Anthony Horst, historian Joseph Podlaski; sergeant-at-arms, Alexander and Richard Plumer, service officer. Commander Rago also introduced his “Legion Wife'” Mrs. Betty Gallo, the president of the American Legion Auxiliary. Rago in outlining the plans for the current year, stressed that all efforts will be made to start the building of the new headquarters on Oakland street this year or in the early part of next year. He mentioned the upcoming Legion Fair beginning on Oct. 9th as the coming event of season and Commissioner Bob Moses may attend to get ideas for next year’s World’s Fair. In closing he remarked, “I am well aware of the demands that have been placed, upon me and I now call upon each member to stand firmly behind me and to exert every effort to help insure that the coming year will be one of the greatest in the history of this great American Legion Post of ours”. 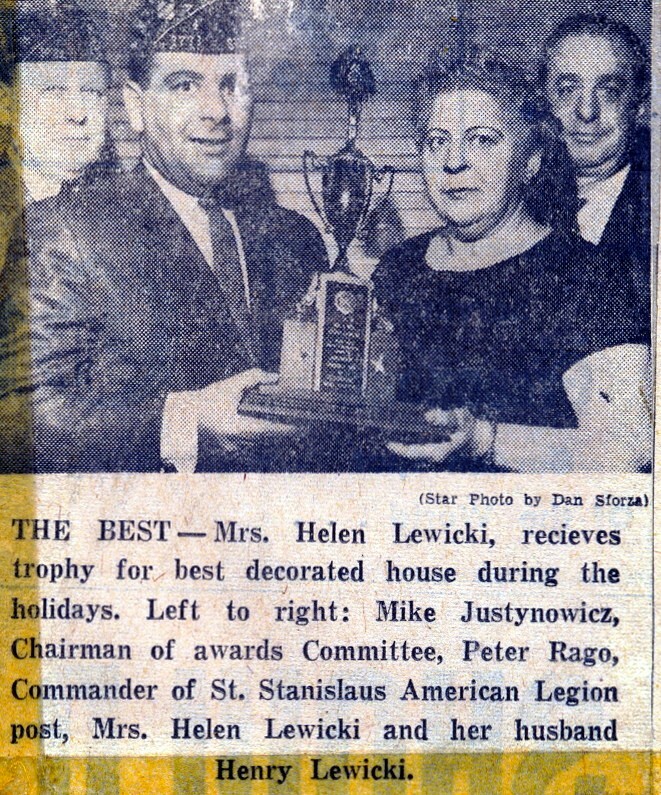 St. Stanislaus Memorial Post, American Legion, this week announced it is opening its 1965 membership drive, according to Post Commander Peter Rago. Commander Rago explained that the “roll call” theme of this year’s drive was to remind all war veterans of their service to their country, which makes them eligible to become legionnaires. “We’re hoping to conclude our drive with a report of all present and accounted for,” he added. The post is joining some 16,500 other community organizations of the Legion throughout the United Sates, various overseas territories, and several foreign nations in the world’s largest annual membership enrollment campaign undertaken by a veteran’s organization. “We plan to have the bulk of our 1965 member ship drive completed by Veteran’s Day to permit us to devote as much time and effort as possible to our community service programs,” Commander Rago stated. “We are accepting dues payments for the coming year now from those Legionnaires and eligible veterans who like to be known as “early birds”. Eligibility dates for American membership are as follows: World War I -April 6, 1179, to Nov. 11, 1918, World War II – Dec. 7, 1941, to Sept. 2, 1945 and I Korean War-June 25, 1950 to July 27, 1953. Meetings are held at the St. Stanislaus Post headquarters at 8 A. M. on the first Wednesday of each month. In other action, the post has arranged a hunter’s safety course, which will be given at the post’s headhunters at 119 Driggs avenue. Classes will begin promptly at 7:30 P.M. Monday Sept. 14 and on three consecutive Mondays thereafter. According to the New York State Conservation Department, any person seeking his first hunting or t archery license must receive instruction from a department agent in fire arm safety and the use of the longbow. Students attending all sessions of the safety course and passing an examination, enabling them to apply for a hunting or archery license. The instructors are all Department of Conservation Agents and members of the St. Stanislaus Memorial American Legion post. The St. Stanislaus Memorial American Legion is again preparing a treat for the residents of the Greenpoint area. Something for everyone, young or old, will be found under the large circus tent being erected on the paved grounds on Oakland Street between Norman and Nassau avenues. The tent will house the “Legion Fair” sponsored by the St. Stanislaus Memorial American Legion Post. The Fair will run for ten days beginning on Friday through to October 18th. Rain or Shine the gates will open at 6:30 P.M. nightly, Saturdays at 6 P. M, and on Sundays at 2 P. M. Admission will be free and a door prize will be awarded nightly. By popular request the main attraction will again afford our patrons an opportunity to win a new Bel Air Chevrolet. St. Stan’s American Legion today announced the winner of the annual contest to pick the best dressed home in the community during the Christmas season. The winners are Mr. and Mts. Henry Lewicki of 121 Jewel street: They have received certificates of merit in the past but this year finally reached their goal and won the coveted trophy. They not only had the outside of their house decorated but they a1so had the picture windows throughout the house beautifully adorned with Christmas decorations. This is a two-story house in which four families dwell. In addition, they also had Nativity scene in their gateway on the sidewalk. The Nativity was a homemade effort that symbolized the spirit of Keeping Christ in Christmas. 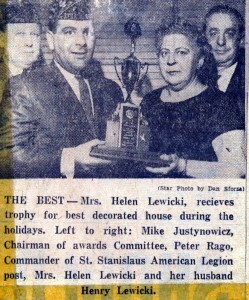 Mr. and Mrs. Lewicki were both pleased and overjoyed with winning the trophy. This is the first time a legion member has won the award. Many homes were beautifully decorated and post members tried to pick a winner without repeating a previous winner. They have chosen all the, best homes in Greenpoint up to this date and if more homes do not show as big former winners the legion may have to revert to old winner for first place next year. In order to win a trophy the, home must have a nativity scene adorning the ‘house and the entire house from top to bottom must have some type of decoration on it. The runners-up who received certificates of merit are: Mr. and Mrs. Joseph Tura, 238 Richardson street; Joseph Sessa, 20 Russell street; Mrs. Marion Wnowski, 632 Humboldt street Bart Urban, 164 Meserole Avenue; Theodore Woroniecki Jr., 225 Calyer street; Edwin Jasenski, 71 Java street; Mrs. Florence DeSantis, 146 Java street. The chairman of our awards committee was past Commander Michael Justynowicz, and Commander Peter Rago hopes to see more homes decorated next year. If the post has done nothing else during at Christmas time the members feel it has helped foster and perpetuate American Legion’s ideals that “Christ” should be kept in Christmas. They also hope that with their urging, as well as other organization urging next year the Garden Spot will not see an advertising sign in Greenpoint by merchants or other organizations with the infamous “Xmas” in place of Christ in Christ. April 4th is the most important day of the year to Post Members. It is important to us because it the day of the year that we will come out in public honor our Post and community dead who were servicemen or veterans. We honor our dead in our every deed and action. We honor our dead in all our waking hours. The reason we come to the public on this day is to remind them to honor the dead the way we do. We know the dead are easily forgotten, especially men who died since they left the service. It is a human tendency for people to forget. It is usually the family of the men and women who halve died, who continually remember. We of Veterans organizations like are dedicated to veterans dead or alive. We come to the public once again to help us pay homage to our dead. It is people like those who died that made our country safer for democracy or helped our wonderful country after they left service. I men and women will never be forgotten as long there is an American Legion. But it is not enough to just remember them on “Our Memorial Day” or “May of every year. That is why we come to you every year remind you to offer prayer for them every day of them as you would honor any hero because they the backbone of our nation. As I said before we know it is easier to forget than to remember. But we come to you each year and ask you to offer, prayer with us, some of you will follow our footsteps and make it a sacred duty every day to ask God to remember the dead of the country who served for our. As point of interest, I would like to inform those who do not belong to our Post that we have at our Post that has the names of all the deceased members of the Post inscribed upon it. We are the only in Kings County that has done this. Every time the bell is struck at meetings or to bring order or at wakes the men whose names are upon the bell are honored. This bell is used at most gatherings. Therefore a body we cannot and will not forget “Our own dead”. As in the past, we will march through the streets Greenpoint. We would like to have as many people possible fly flags from their windows whether it large flag or a small hand flag on a stick. This is your way of joining us in honoring your and our dead veterans. In these times of trials and tribulations with powers let us show them that in the midst his, we will never forget our dead. By remembering the ones who have gone beyond and who at one time helped make this country what it is today, we are remembering the dead of all wars lilt the foundations of the most wonderful in the world the United States of America. Join us by watching us March in honor of our dead. Join us alt the Most Holy Sacrifice of the Mass on April 4, 1965 at 11:00 A. M.
From its inception sixteen tears ago, St. Stanislaus Memorial Post, American Legion has grown from ignoble, infancy to one of the strongest and leading posts of Kings County. This has been achieved in such a short period of time because men in all walks of life have found the time and energy to assist in its growth. It is active in church, community and veterans affairs, thereby attaining a reputation that all members of the Post can be proud of. This memorial Mass and parade is only one of the many activities conducted by the Post during the year. Our aims and goal for the coming years are high but with God’s help, they will be achieved. We welcome all veterans of the community who are eligible to join our Post to share in its rewards. Meetings are held on the first Wednesday of every month at Post Headquarters, 119 Driggs Avenue. Commander Peter Rago, Vice-Commanders: Leonard Wasniewski, Stanley Jaskot, Edward Horst; Service Officer Joseph Wisniewski; Adjutant Rudy Fafalak; Finance Officer Michael Justynowicz, P. C.; Acting Chaplain Frederick Orzechowski; Historian Anthony Horst; Judge Advocate Alexander Malewski, Sgt. at Arms Joseph Podlaski; Executive Committee: Edmund Zilinski, Felix Wroblewski, Philip Spizuoco, John Montango, Matthew Wilson. Also our past commanders. The St. Stan’s America Legion annual “Our Memorial Day” parade will be held on Sunday at 10:15 A.M. when they assemble to march at North Henry Street between Driggs and Engert Avenue. This is the 16th year that the post will hold their parade in the Garden Spot. Peter Rago, post commander, said: “April 4 is the most important day of the year to the post members. It is important to us because it is the day of the year that we will come out in public and honor our post and community dead who were servicemen or veterans. We honor our dead in our every deed and action. We honor our dead in all our waking hours. The reason we come to the public on this day is to remind them to honor the dead the way we do. We know the dead are easily forgotten, especially the men who died since they left the service. It is a human tendency for people to forget. It is usually the family of the men and women who have died, who continually remember. We of veteran’s organizations like ours are dedicated to veteran dead or alive. “We come to the public once again to help us pay homage to our dead. It is I people like those who died that made our country safer for democracy or helped build our wonderful country after they left service. These men and women will never be forgotten as long as there is an American Legion. But it is not enough to just remember them on “Our Memorial Day” or May 30th of every year. That is why we come to you every year and remind you to offer prayer for them everyday. Honor them as you would honor any hero because they were backbone of our nation. As I said before, we know it is easier to forget than to remember. But we feel if come to you each year and ask you to offer prayer with us some of you will follow our footsteps and make it a sacred duty every day to ask God to remember the dead of the country who served Our country,” Rago added As in the past, the legion will march through the streets of Greenpoint. They would like to have as, many people as possible fly flags from their windows whether it be a large flag or a small hand flag on a stick joining the post in honor the dead and our dead veterans. The arrangements for parade and memorial mass services were conducted by the acting chaplain, Fredrick Orzechowski, with assistance of practically all members of the post. The all out drive against Narcotics addiction in the Greenpoint Williamsburg area got off to a good start last week when an estimated 400 persons attended the special session held at Automotive High School on Bedford avenue. 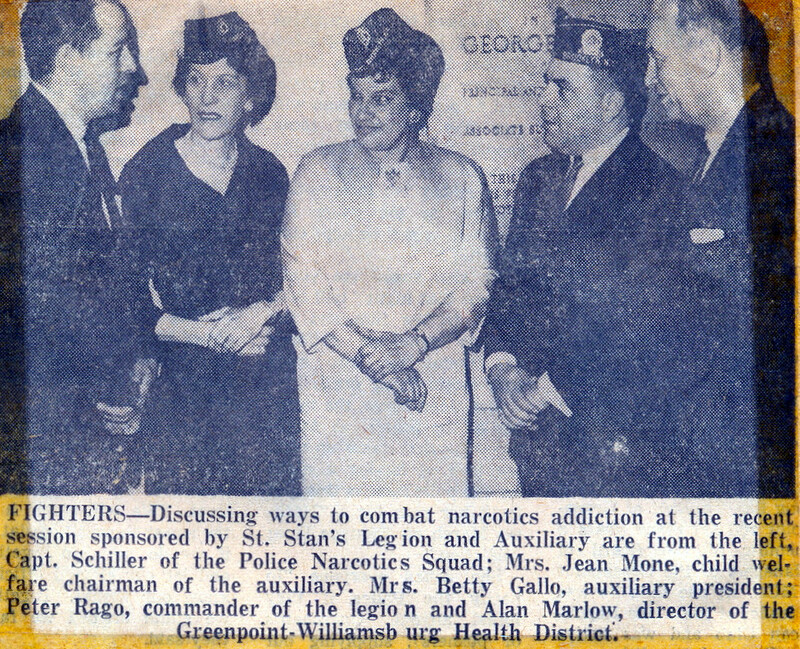 Sponsored by the St. Stan’s American Legion and the Auxiliary, the program was the first part of a community wide effort to keep the public informed as to the hazards and symptoms of the narcotics. By the time the crowd saw the film and finished listening to the outstanding speakers, each and every person left with a better knowledge of the problem and how to cooperate with the police department in fighting the problem on a community basis. The film, provided by the Health Department, displayed the pitfalls youth or anyone else becoming addicted to drugs. Allen Marlowe, district health officer then spoke about the hazards and havoc drugs do to a human body. He explained how important it was to get treatment to our youth before they be come addicted. His point was to spot I children taking harmful drugs that sooner or later. I lead to heroin addiction. When spotted they, for their own good should be aided and persuaded to take treatment or they will surely end up the torments of drug addiction.